As I shared some of our favorite Hamburger Recipes, and my family’s love of all things burger related, I left out a very simple detail about necessary condiments. A few of our children will eat ketchup on anything, yes anything, and they get that from their momma. I’ve narrowed the reasoning down to my pregnancies. I do believe that all the ketchup and fries I consumed while they were in utero and my distinct cravings must have rubbed off on their DNA. In fact, my parents still remind me of my eldest brother’s rehearsal dinner. It was a fancy affair, as in steak and lobster at a country club type fancy affair and I made a special request. Yes, that fancy request came in the form of a burger; burger, fries and ketchup to be exact. You see, I’ve never had a complex palette. It’s embarrassing to admit, but if you gave me the choice today, I might lean towards a burger and fries again, but ONLY if you top them with a great ketchup. So when we were at my sweet friend Patty’s for a cook-out and she shared her All Natural and so very Easy Homemade Ketchup recipe, I knew I must pass this on. As much ketchup as our family goes through, I’ve wanted a great recipe without all the junk, but that ends up being quite expensive. 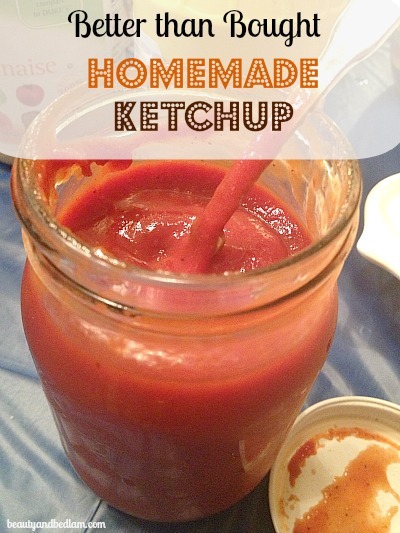 I also wanted an easy Homemade Ketchup recipe that I could whip up and make in large quantities and this is it. I love that this recipe works perfectly with the 17 day diet too, since it eliminates processed corn syrup and carbs. Plus, I get to add on another use to my 50 ideas for Mason Jars post. It’s just extra cute stored in my Mason Jars. As you can see, this is considered All Natural, meaning the best of ingredients were picked like organic tomato paste and stevia for sweetener, but you may substitute if you don’t have those on hand. As with any recipe, once you make this, tweak to your family’s taste. Add more garlic if you are garlic lovers or additional minced onion with a dash of red pepper flakes for extra heat. Our goal is to give you a base to start with and then feel free to change it up. Let me tell you, it will be hard to go back to store bought once you realize just how easy this All Natural Homemade Ketchup is to whip together. No, it’s not going to taste identical, but it also won’t have all the junk put in the store bought. I can’t wait for my bumper crop of tomatoes from the garden because I am going to attempt to use my fresh tomatoes to make ketchup. That will be super delicious and a great way to use them up. Don’t forget to add some healthy, homemade fries with this ketchup. Blend together in food processor until smooth. Put in small saucepan and heat on medium heat for about 5 minutes, stirring often. Let cool, then keep refrigerated. 3 TABLESPOONS of stevia extract? Is that accurate? That seems like an awful lot of stevia for the amount of liquid you have. I just wanted to double check before making this, as I don’t want to waste my ingredients. Yes, that is correct. It’s a sweet ketchup. For a typical ketchup recipe of this size, it’s normally about 1/2 cup of sugar/brown sugar. If you are worried that it’s too sweet, I recommend starting with less, maybe 2 tablespoons and tasting it. You can always add in the extra tablespoon later. @Rachel, I think you may be thinking of the extra-concentrated stevia bottles with the dropper? (if so, I agree…three tbs of that would be wayyy too much!!) I think what she meant, and put in parentheses in the recipe, is to use the powdered kind of stevia (very different/less concentrated than the extract version), such as Stevia in the Raw.. Since this recipe was taste tested with stevia, I would begin with 1/3 cup of brown sugar. After simmering, just give it a little try and determine if you need more. It’s always easier to add more sweetener. Oh I’m excited! Thank you for sharing this recipe! I’ve been looking for an alternative to the junk filled regular store bought ketchup, and the extremely expensive organic store bought kind. 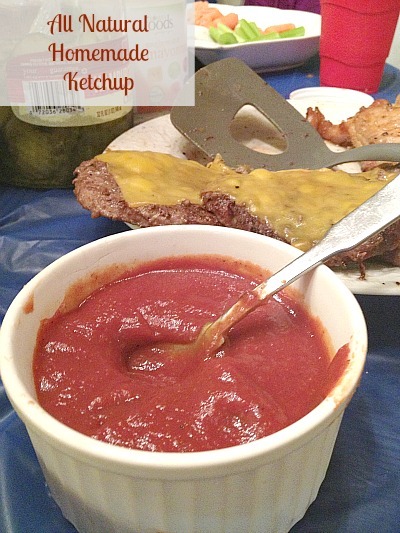 My youngest absolutely loves ketchup, so I must try this recipe. How long does this last in the refrigerator? It goes quickly in our home, but I would guess 2-3 weeks if sealed in a mason jar or container. am trying it lets see if my son likes it? @shereng2, Since the Ketchup recipe has a good amount of acidity, and all natural ingredients you should be able to can this recipe. Just keep in mind, time and temp. It’s the same as you would can tomato sauce. However, I would go with the brown sugar instead of stevia extract. Why spend the extra money? Note: Stevia rebaudiana, commonly known as “stevia,” is the name of a plant native to South America that is used around the world as both a natural sweetener and traditional medicine. By the way, Stevia is 300 times sweeter than regular table sugar. Food Sciences and Nutrition” found stevia may be beneficial for people with diabetes and anyone trying to cut back on calories. However, the FDA has not approved use of the whole-leaf stevia or any products marketed as “stevia” as sweetening ingredients because of a lack of safety information and concerns about raw stevia’s effects on heart, kidney and reproductive health. Thanks so much for adding this info. Brown sugar is a great substitute. The only reason some lean towards stevia is attempting to find processed sugar alternatives, but agree about the cost. IS THERE ANYTHING THAT WILL REPLACE THE STEVIA? Here’s a thought…. since molasses is added back into white sugar to get the brown sugar we know today…. how about stevia with a tablespoon of molasses? That sounds like a great option, for sure.